This craft project is a kid version of the grown-up Serendipity Square Cards tutorial. Like in the adult version, scraps of paper are used to make colorful serendipity squares that can be combined in many ways to make one-of-a-kind greeting cards. 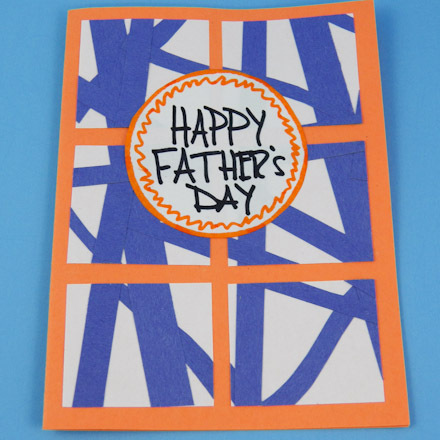 In this project, kids combine construction paper with serendipity squares and a Father's Day greeting to make a card for Dad. 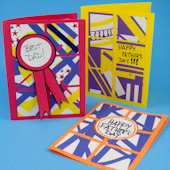 Every card is unique and showcases the creative ideas of the child artist! Of course, the card can be made for any occasion by changing the greeting. Gather scraps of paper in a variety of colors. Cut any large scraps into smaller pieces that are no larger than ½" in the smallest dimension. 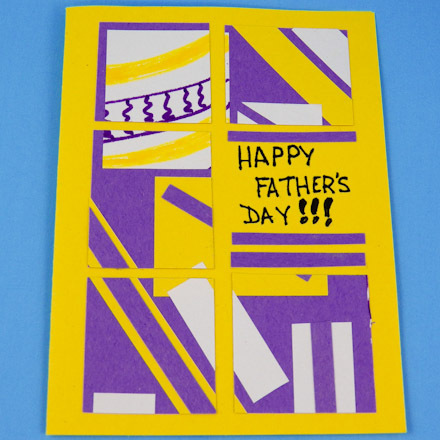 Tip: If you are short of scraps, randomly cut strips of paper with a paper cutter or scissors. Fold the 9" by 6" colored construction paper in half. This is your card blank. Set it aside for now. Tip: Plan ahead. Will the card be presented in an envelope? If so, check the card against the size(s) of envelopes you have. Cut the card down a bit, if needed, to fit inside the envelope—do this before cutting your squares and gluing them to the card. See Aunt Annie's Envelopes to Make project for printable envelope patterns—the Invitation envelope pattern fits a 4¼" by 5½" card. Sort your scraps of paper by color. 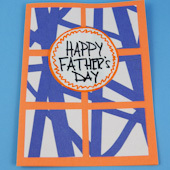 Select scraps in one or two colors that coordinate with the color of the construction paper card blank. If you have a specific idea for the card you are making, keep that in mind as you sort the scraps. Tips: You don't need many scraps to make enough serendipity squares for your card. It just takes enough to partially cover one of the 4½" by 6" pieces of white paper. Glue the selected scraps to one of the 4½" by 6" pieces of white paper. Use a generous amount of glue as you glue the scraps in random ways—don't think about it too much, just have fun. Let the scraps extend beyond the edges of the paper. Continue gluing scraps until the paper is at least half covered. Be sure all the scraps are completely glued to the paper. Once the glue is dry, flip the collage paper over and trim away all of the paper scraps that extend beyond the edges of the paper. Cut a 1" strip off the side and then a ¾" strip off the top of your collage paper. Set the strips aside to use inside the card. Cut the collage paper into six 1¾" squares—don't worry if the sizes vary a little bit. For the biggest surprise, draw cut lines for the squares on the back of the collage paper and cut the squares with the paper face-down. Flip the squares over. Check the corners for any loose paper and apply glue as needed. Take four to six serendipity squares and arrange them on the card front. Trim the squares, if needed. Once you are happy with the arrangement, glue the serendipity squares in place. Get creative: Mix the serendipity squares with stamped images on your card front. Or make rectangular serendipity shapes to mix things up! Keep a supply of serendipity squares on hand to make more cards or to use in other paper crafts. Cut a 2" circle out of white or yellow paper. 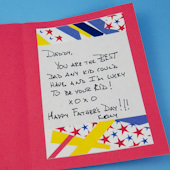 Use a marker to write an award message—"#1 DAD", "Best Dad! ", "Greatest Dad", etc. 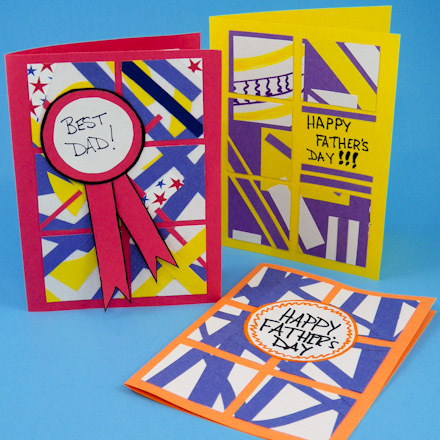 Cut two strips of paper shaped like ribbons from the same color of paper as the card. 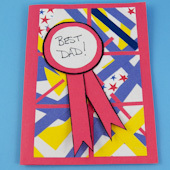 Glue the ribbons to the back of the circle and glue the award ribbon to the card. Tip: Decorate the award ribbon anyway you like or make a circle medallion with a message. See the sidebar for ideas. Cut 1" strips off the side and top of a 4½" by 6" piece of white paper. Glue the strips cut from the collage paper to the top and bottom of the white paper. Trim the strips as needed. Write a message on the white paper or draw a picture, if you like. Try something like, "Happy Father's Day!" or "You're the best dad and I'm proud to be your kid!" Keep dad in mind and what you would like to say to him . That's it! Your Father's Day card is done! Tip: Use two contrasting colors of scraps for your collage paper and maybe add a few accent pieces in the color of the card. You can also add scraps of fancy paper in the same colors. Tip: Make an award metal and ribbon from paper for your Father's Day message. Tip: Keep it simple by using scraps of just one color to make your collage paper. Tip: Make a white circle medallion for your card's greeting and decorate it with markers. Tip: Use colored paper as the base of your collage instead of white paper. Glue on scraps of paper in one other color and white. Add fancy papers in the same colors, if you have any. Tip: Leave one space on your card empty and use the space for writing your card's greeting. 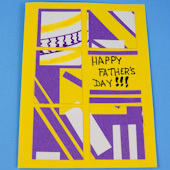 Tip: Use the strips cut off the collage paper to decorate the inside of the card.